Benjamin Franklin once said, “Beware of little expenses. A small leak will sink a great ship.” As a freelancer, I’m always on the lookout for free tools that can help me grow my business. Whether it’s an online marketing tool, an online organizing app, or even a local resource, I’m on it if it’s worth my while. I’d like to share the resources that I’ve found; I’ll also invite you to share your best freebies with me on social media so we can all grow! These tools are appropriate for freelancers in all fields: writers, web designers, digital marketers, bloggers. Don’t let your desk look like this! Harness the power of free tools and get organized today. Although I am successful as a freelancer and get plenty of work, I still think carefully before I spend one penny–free tools allow me to keep a tight budget. Here are my favorite free tools for keeping organized. Yes, I know Google knows my every move; there are some people who hate that. However, I use my Google Calendar tool every day. I track my appointments with new clients, schedule writing time, and even set myself alerts when it’s time to stop writing and go to my other job! Without those alerts, I would completely lose track of time! It syncs with my phone and allows me to set up video chats with new clients from anywhere. If you haven’t tried it yet, give it a shot. It’s been a game-changer for me. Note: you must have a Google account to use this free tool, but who doesn’t? Technically, Dropbox is free. Albeit the storage space on the free version is limited, I love storing files on Dropbox from time to time. This is especially helpful if I’m collaborating with someone who is a Mac/Apple user. Dropbox shares files seamlessly between Apple OS and my Chrome OS/Android phone. Trello is a free project management tool, but we have found ways to use it for everything from projects to party planning. Here at Word Innovations, we use several boards. I use one to keep each of the tasks for our WI website prioritized and private boards for custom freelance jobs. Think of each Trello card as an index card you can slide as the task moves throughout various stages. It also allows me to send direct messages to my teammates, ensuring we all remain on the same exact page. Click here to sign up for Trello for free. We each blog to create awareness of our services. Naturally, we are diligent and work hard to represent our skills in a positive light. We use the platform to convince potential prospects that they really do need our services! I hate plagiarism. Not only can you steal someone’s written word, but you can also rob a photographer of their hard work capturing photos. I once wrote a blog post that I thought was especially proud of on my DIY website. Apparently, another blogger liked this content a lot. She published my best ever article on her blog, without my permission, and took credit for the article. The worst part of the experience was that her blog was one that was a well-established one with thousands of followers; she got literally 15,000 reads on that single post. My little, then brand new blog, only received somewhere under 20 views. I bet many of you have experienced the same thing! But, when you grab images off of Google photos without the photographer’s permission, that’s exactly what you’re doing. Freelancers and small business owners need images to create compelling social posts and content. Photos have a way of grabbing a casual reader’s attention like no other medium online. So, use them wisely and legally! Pixabay offers an enormous database of royalty-free photos. They have a wide selection of free images. I like to give a backlink to the image when appropriate, but it’s not required. No credits are required on Pexels, although a shout out to the photographer is appreciated. The gallery is small, but the images are stunning. And, it’s free. Who can complain? This site duplicates many of the same images you’ll find on Pixabay, but it’s user-friendly. Who knows? Maybe you’ll find a hidden gem. Unsplash also offers free images, no strings attached. I love the “people pictures” on this site when I want realistic, very human photos. You’ll find more variety here than on Pexels or Pixabay. I can’t say enough about the importance of good grammar. I’m not a grammar snob, and I’ve been known to use some slang phrases myself. However, I know that submitting freelance work to a client dictates a certain level of professionalism. This commitment to great writing includes correct grammar, spelling, and word usage! Your clients expect great work and proper Grammar. Sign up for a free account with Grammarly to deliver that quality. I run every paid piece of work through Grammarly before I send the final content off to my clients. Then, I check the content for plagiarism–which happens accidentally by use of a common phrase–and make edits prior to sending the completed work off to my clients. This resource has prevented me the embarrassment of a misused word that MS Word failed to catch on many occasions. As a side note, I do not use Grammarly Free. I use the upgraded Premium version as my whole career revolves around crafting letter-perfect phrases. Not sure how to use a word? Don’t guess, look it up on dictionary.com. Gone are the days of toting out the heavy book, blowing off the dust, and thumbing through the pages to find the spelling of a word you don’t know how to spell! You can now find that information in just a few keystrokes. Have you ever had a word at the tip of your tongue and couldn’t think of it? Use Thesaurus.com to refresh your memory. The older I get, the more often I need it. Whether you are creating online content or crafting a pitch to a social influencer, you need to engage your readers. The thesaurus is one of the best free tools to shape language that isn’t overused or, I’ll dare to say it, boring. I will admit that I’m not a great graphic designer. While I can create some very limited graphics and doctor up a photo, I’ve only used one source to do this. My free photo editing resource of choice? This is a Pinterest pin that I created today for my DIY blog–simply grabbed a template I liked from PicMonkey and swapped out the photo and text. I created this image in less than 60 seconds. 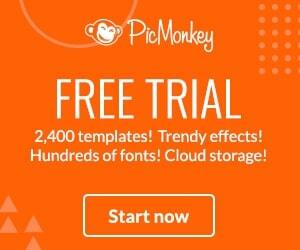 The nice people at PicMonkey offer tons of free templates, overlays, borders, and fonts. You can create graphics from scratch or edit photos that you’ve taken to create your own original images. Plus, you have access to their template database. Take a template, swap the image out for one of your own, type in your caption, and voila! It’s fun and easy to use PicMonkey. It only takes a few minutes to learn. Although I admit I’m a PicMonkey affiliate, I can honestly say this is the only resource I use. I’m a writer, not a graphic artist. I have tried others but find them too complicated. I started out with the PicMonkey’s free version, and I enjoyed it for two years. Now that the freelance business has grown, I’ve unlocked the upgraded features of the step-up version–click below for a free trial. Use your money to purchase the resources that you do need. Find free tools online to help you run your business, manage your time, and operate your business. Also, don’t forget to look at your local community resources. These may include free small business workshops or community arts events. Local resources are often overlooked but can build community goodwill and spread the good news about your successful freelancing or digital marketing business. While your business might net most of its clientele online, a few local referrals can bolster your morale. Give these free tools a try. Be sure to share your comments and opinions–would love to hear! Affiliate Disclosure: Some of the links in this post are affiliate links. This means if you click on the link and purchase the item, I will receive an affiliate commission at no extra cost to you. I only recommend products that I know and love.